Morten says. 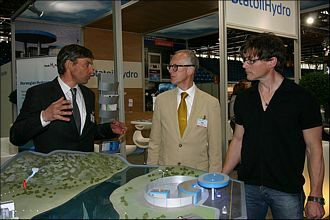 Here with Harald Røstvik at StatoilHydro’s stand. Morten is currently at EVS 24 (a world congress and exhibition for electric, hybrid and fuel cell vehicles), which is being held in Stavanger, Norway this year. As previously reported, he is scheduled to do a short live performance tomorrow morning. But he will also do a longer set tonight, according to Stavanger Aftenblad. VG talked to Morten earlier today, as he was given a private tour of the exhibition area to see new environmental technology. “Our society is so slow. The environmental problems that we’re concerned about today are more or less the same things we already knew about 25 years ago. We could have taken the necessary measures back then“, Morten told VG. In 1989, Morten together with Magne Furuholmen, Harald Røstvik and the environmental foundation Bellona, brought the first electric car to Norway. But he feels that there hasn’t been enough development happening since then. In other news, some of you have been wondering if there will be a music video for “Foot Of The Mountain”. It has now been confirmed that they will be shooting the video next week in Germany.